West African Black Soap and Morrocan Black Soap. All you need to know plus pictures. 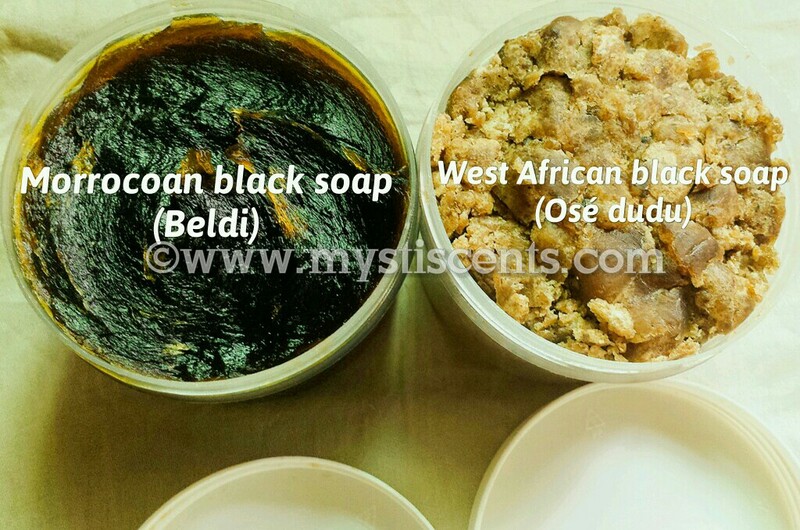 If you are searching the internet to find the similarities and/or differences between the West African black soap and Morrocan black soap, then read on. Black soap native to West Africa (ose dudu (Yoruba) Anago/Alata Samina (Ghana) is made from dried plantain peels, palm leaves (palm oil) and coco-pod ash. Plantain skins are largely what make this black soap so effective. They are a natural source of vitamins A & E and iron. Dried plantain, Palm leaves and coco-pods are then roasted in a clay oven to produce ash. Water is added to the ashes and filtered. Cocoa pod is the shell of the cocoa fruit and also has natural healing properties. Ingredients like shea butter, coconut oil, palm kernel oil or cocoa butter are heated and added, and hand stirred by local women for at least 24 hours. The soap solidifies and moves to the top, is scooped out and the mixture is set out to cure for two weeks. Skin exfoliation is very important if you desire a healthy and glowing skin as well as an even complexion. When dead skin cells are scoured off, then skin treatments creams and lotions for toning and even healing of stretch marks can function well. 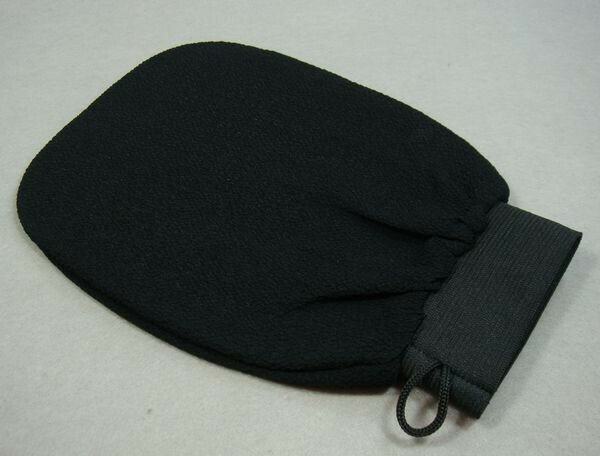 Kessa Glove is quintessential to the Hammam ritual which originated in Morocco but has been adopted by beauty conscious individuals all over the world. The Kessa glove is long lasting and made of granular tissue used for a deep skin exfoliation, removing dead skin layers, toxins and stimulating blood circulation. Reveal a smoother, softer skin with a glow! Good skincare includes proper exfoliation and moisturizing regularly. Exfoliation helps the skin get rid of dead cells to reveal a smoother and brighter complexion and moisturizing helps keep your skin soft and healthy. The difference between a body scrub and a body polish is that the body scrub just exfoliates and a body polish exfoliates and adds back the moisture that was stripped from the skin during exfoliation. 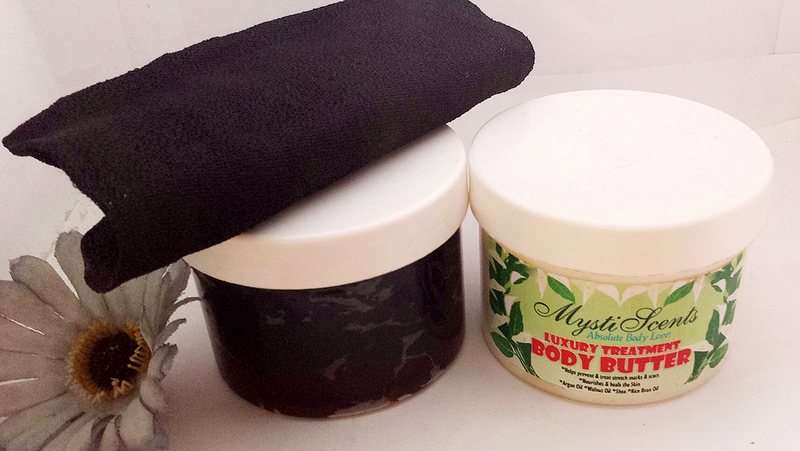 A body scrub, body polish and moisturizer rolled in one amazing product? That is MystiScents ExPolish!